Will jumping around in front of your mobile catch on? After the excitement over its two older brothers, the Satio and the Aino, it's the turn of the Yari to impress the world as part of the new Communication Entertainment message from Sony Ericsson. Dubbed as 'high end pre-pay, low end contract' the Yari is clearly a phone for the youthful and active, as its main role in life is to be a gaming device and not a lot more. That's not to say it doesn't have a decent feature line-up behind it (5MP camera and decent music playback are mandatory options for a phone to be considered part of the Communication Entertainment line up) but it's just you can tell that this phone is ready for gaming. The first clue is in the interactive home screen. You have to enter applications to unlock the gaming carousel, but once done, it synchronises with your home screen and runs in the background. And when we day runs in the background, we mean it, as the little gaming icons sit happily in the faded distance on the home screen, ready to pop back up to life whenever you need them. 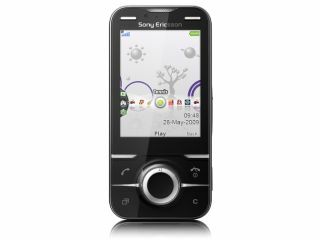 And the connectivity is what Sony Ericsson hopes will make the difference with the Yari, as the idea is you can easily scroll up and down the different gaming types as well as check out what games are proving popular downloads on an easily accessible chart. The visuals of the home screen were impressive, and you got the impression that you had a fair wealth of options at your fingertips. We decided that we couldn't really call this a hands on if we didn't at least give ONE of the games a try, so we decided for a Wii-Fit-a-like, which asked us to initially do squats. The instructional messages at the start had us setting up the phone ready first time, (although the disclaimer stating we shouldn't do these exercises if unfit was a bit worrying) and when we performed our three squats it registered each one happily. Obviously in a full test we'll run through the full range of squats and other exercises, but in a room full of journalists we decided against breaking out the Spandex and grunting with effort. Clearly this type of gaming is one for the home. This phone is actually quite confusing to hold in the hand. It feels quite light and almost plasticky, but weirdly not in a bad way, and also the range of functions on hand felt plentiful. Knocking the pleasant-to-touch navigation wheel upwards started the music player, left and right were messaging and Bluetooth, with down activating the contacts (although these are customisable) and the whole think slid up and down with a nice action. With Sony Ericsson's UI once again plastered all over this device, it's hard to find something massively different to write about, although the addition of a search button on the home screen was a nice addition out of the box. However, after being able to search through the whole phone on the Satio, it was a bit upsetting not to be able to do it on the Yari as well. We know the two are miles apart in terms of functionality and price, but still, it would have been nice. The camera, a 5MP effort as mentioned before, is a decent snapper for a phone of this calibre, taking good pictures without much in the way of blur, even with our notoriously shaky hands. The wealth of photography features weren't as apparent on this handset compared to the Satio and Aino, but Face Detection and Photo Fix were options we could see being useful in the future. This phone is something of an all rounder without being stellar at anything (besides gaming of course, and it will be interesting to see how Sony Ericsson finds the rest of the world outside of Japan takes to jumping about in front of their mobile. For its likely price bracket (although this hasn't been set yet) it looks a good bet, especially those looking for a new handset but love Sony Ericsson. We want to have a good go with the back catalogue of games, as well as the connection to the Play Now suite of additional content, so we're awaiting the chance to bring you a decent hands on with bated breath. But don't worry, it's coming soon!